Searching for a different photo to illustrate an event, I found this. It fills me with sadness. 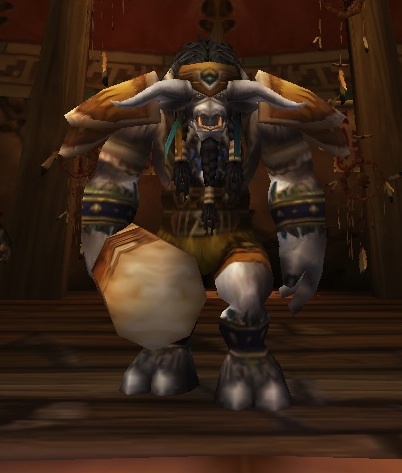 This is Cairne Bloodhoof, the late leader of the Tauren. The Tauren have a very interesting lore. I didn't know much about the Horde side until I was disenchanted with the Alliance guild I was in at the time. I thought a change of faction might help my ennui and disenchantment. I did some brief reading and felt the Tauren would best fit with my play style. Cairne was more neutral toward the Alliance than the other leaders. Alliance could have had Tauren, but, in the lore, we treated Cairne rather badly and Thrall stepped in. 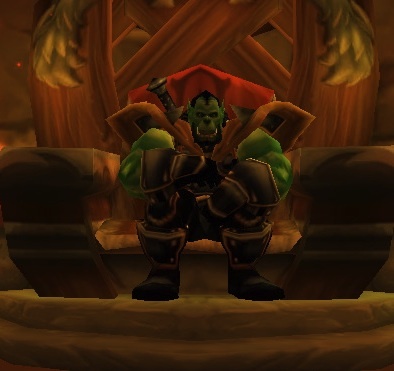 Prior to the Cataclysm, he was the overall leader of the Horde. For people who started playing in the Cataclysm or later expansions, they have no idea, unless they read the lore, that these two were a part of the hierarchy. You get a sense of this in a brief quest chain in Warlords, but brand new players won't know any of why there is a confrontation between Thrall and Garrosh. And Cairne's death is not at all covered for Alliance players. If you didn't read The Shattering by Christie Golden, you don't know any of the backstory for why Cairne's son, Baine, is now leading. That is a very compelling story, one that is not fully developed within the game. It's funny how story telling can affect your emotions. Within the whole Horde versus Alliance construct, there were people who were crafted to be somewhat neutral and trying to find ways for the two sides to live peacefully. If you only play one side, you don't get to see how the other leaders or NPCs react to the opposite faction, which is a good reason to play the other faction for a time. I felt respect for Cairne, for what the storytellers had him doing. When he died, under extremely sinister and deplorable conditions, I felt a genuine loss. I hope, in a future patch or expansion, the conditions under which Cairne died will be more fully developed and we, as players can right this wrong. I have photos of these two because my tauren interacted with them. I didn't interact with the troll chief, Vol'jin, nor the undead ruler, Sylvanas, or the blood elf head, Theron. I'm kind of sad I didn't go out of my way to document them prior to the Cataclysm. These photos show what the original Horde leadership looked like. So many changes.